Hair loss ? 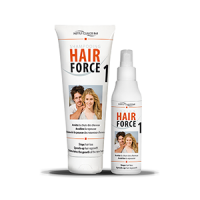 HAIR FORCE ONE Shampoo & Lotion may be the solution to your problems. Volume, firmness, tonicity: for women who desire a more developed and firm chest. The targeted treatment to strengthen and refine the bust and neckline: rapid smoothing effect in only 15 minutes + long-lasting skin firmness and tone.